If you think lush green vegetables require too much water to produce successful crop, or if water is a precious resource, then think again. 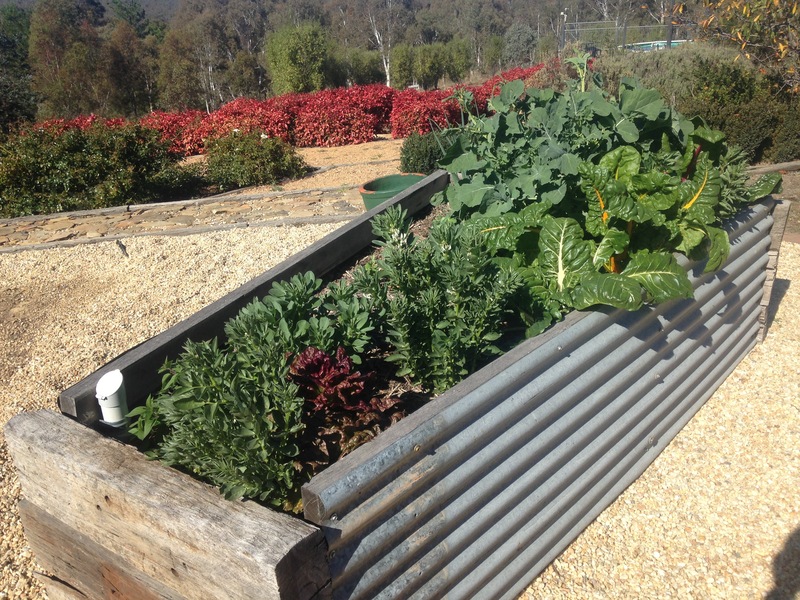 Wicking or self watering garden beds may provide the solution you require. Even of the Rock Farm, we have been able to enjoy some fresh vegetables during a long hot summer by this simple principle. Lush green vegetables even in severe drought. Wicking beds essentially provide water from below, meaning that they are particularly frugal with water consumption, especially during a long hot summer. They also don’t cost a fortune to make – especially if your wife is a hoarder and you have plenty of old railway sleepers and corrugated iron lying about the place. The basic concept is simple. Water is held in a reservoir at the base. Moisture is drawn up into the soil via capillary action or wicking. The moisture is distributed more evenly through the soil, creating better growing conditions for plants. The best part is that you can make these beds out of almost any material. It is simple to modify the style and shape of these beds to suit your garden or materials at hand. 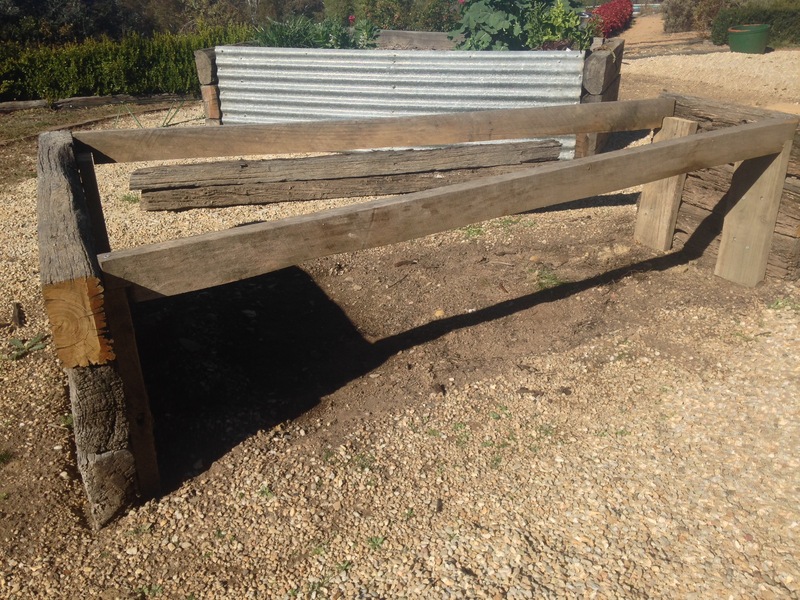 We chose to make our wicking beds in a wedge shape around a central fire pit. 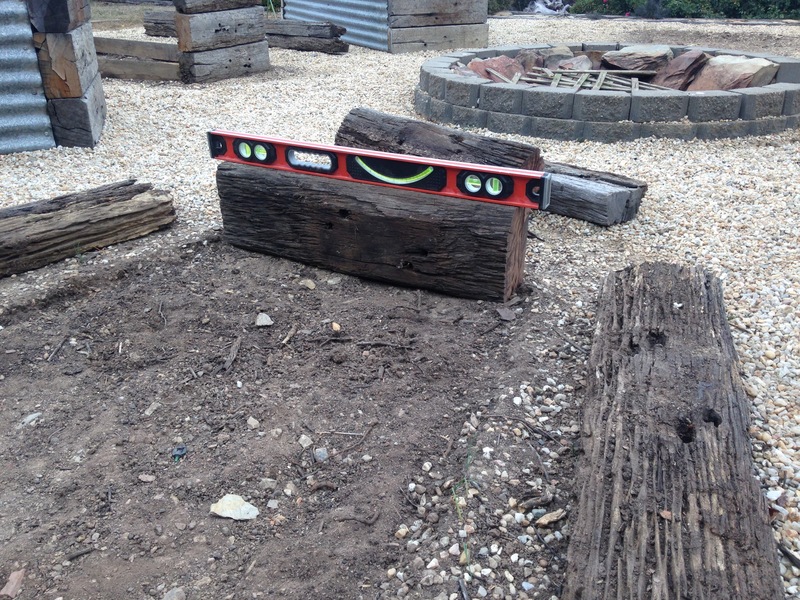 This allowed us to recycle some original railway sleepers. 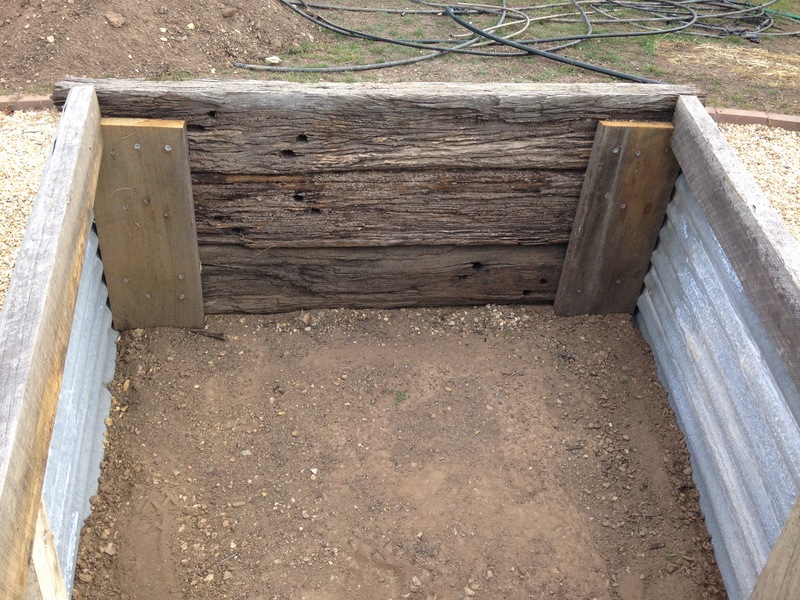 In this way, each wicking bed only used three sleepers. The 2400mm sleepers were cut at the 16000/800mm mark to make the wedge shape. The corrugated iron sheets were 2400mm long. The first step was to clear the ground where the new beds will go and get everything nice and level. Once I was happy that the base was in the right spot, I placed the next sleeper on top, and secured it using a backing plate and bugle head screws. This is extremely hard work on the electric drill. Indeed it destroyed my first drill – so be careful with your drill. Pre-drilling the holes only helps marginally. 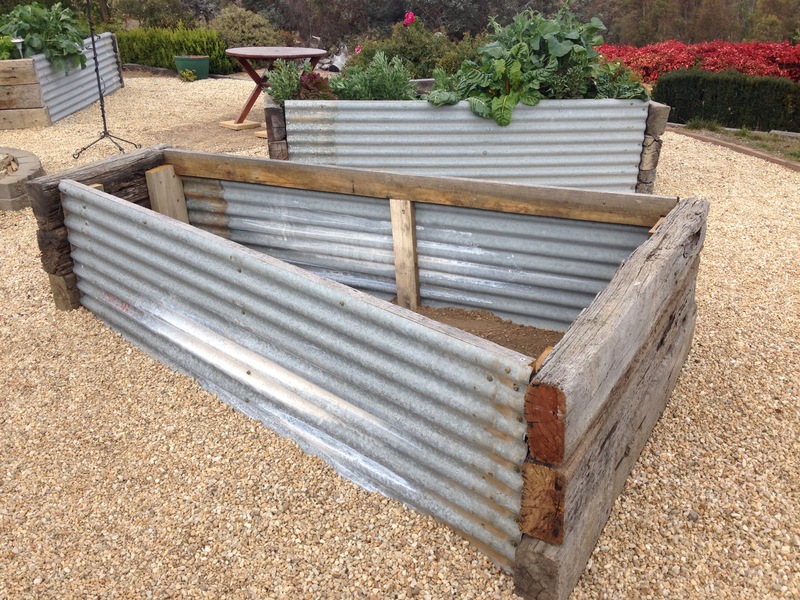 Our wicking beds were designed to be the height of three sleepers. We anchored the sleepers to each other using the backing plate. This will be hidden once the beds are constructed. 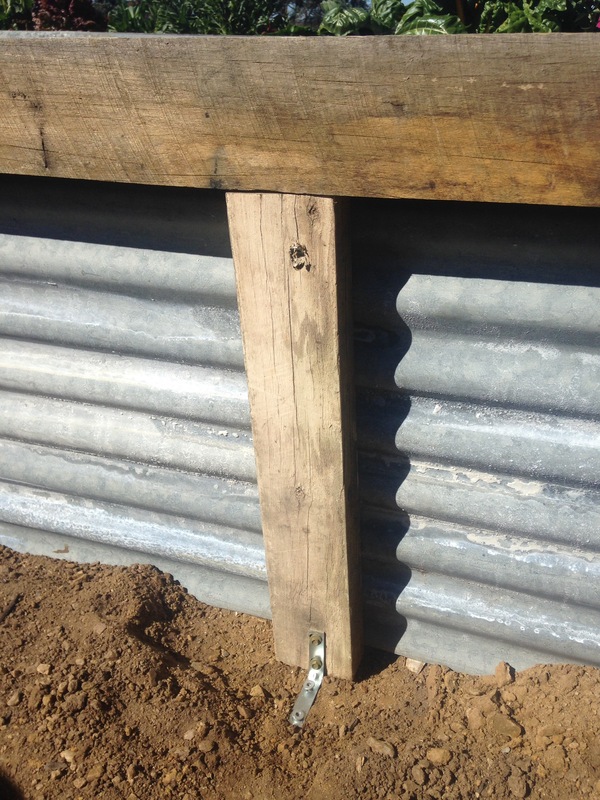 After I had built both ends, I fitted a hardwood brace or frame for the corrugated iron. This brace was cut to the same length as the corrugated iron and will anchor the iron and provide an edge for the beds. I had to take out a small corner in each end to allow the boards to sit level between the two end sections. I then cut the corrugated iron to fit. You can use tin snips for this, but an angle grinder makes short work of it. The cut edge is placed on the ground and is buried slightly, and the original edge is placed along the timber frame. I used regular roofing screws to hold the iron against the frame. 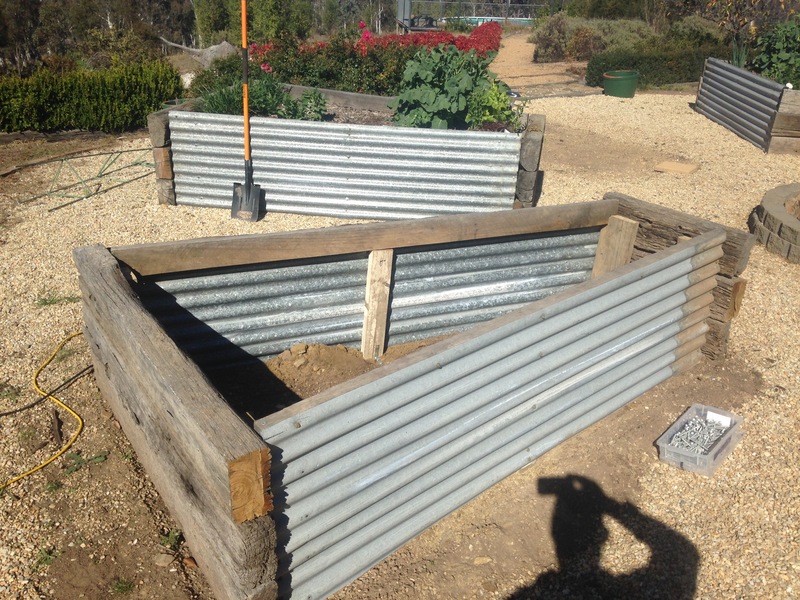 After I had fitted the corrugated iron, I placed a bracing piece in the centre of each sheet. This provides an anchor for the sheets and helps prevent the beds from swelling or bulging once the beds are full of gravel and water. After I was happy that all was in its place, It was time to scrape back the dirt and smooth out the base of the beds. At this time the main construction of the beds is complete. There is still a whole heap of work to go. The beds need to be lined with old carpet underlay / cardboard to protect the builders plastic. Then the beds need to be lined with builders plastic to make them watertight. Then soil and compost fills the remainder of the beds. These steps will be covered in Part 2 of this series. 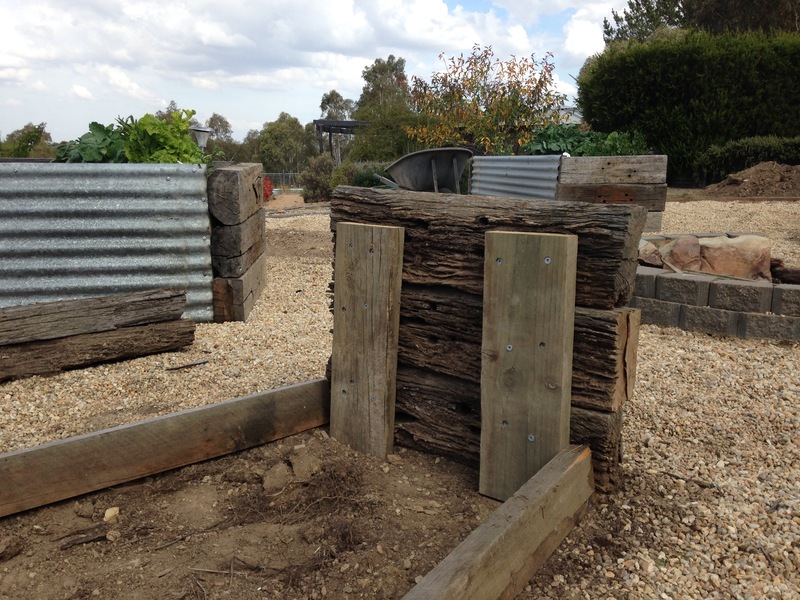 The beautiful thing with these garden beds is that you can build these with just about any material. It takes a little imagination and work to bring your ideas to life. If you have wicking beds, please feel free to share photos of them with me at hamalochonline@gmail.com and I will post them for others to see here. Chainsaws work best when they are sharp. Dull chains are slow to cut, and become dangerous. An easy way to tell how sharp your chain is, is to check the size of your shavings – good size chips mean your saw is sharp. Fine powdery dust means you need to sharpen your chain. It might also mean you are cutting seasoned Australian hardwood, which can be almost impossible to cut with a chainsaw. Cutting seasoned hardwood can be extremely hard on chains – I used two sharp chains to cut through this trunk. Many people find it easier to have more than one chain on the go. I generally buy a new chain each year, and over the past few years have gathered half a dozen chains. If you are going to run stock on your hobby farm, sooner or later you will need a set of yards. Yards are essential to safely work stock, allowing you to perform regular health checks on your animals. 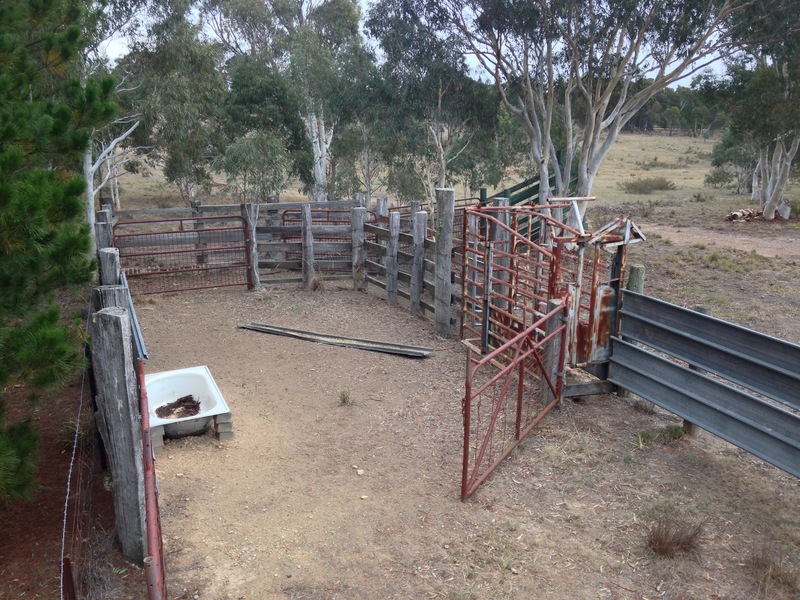 On hobby farms, it is often difficult to justify a large sum of money for a shiny new set of cattle or sheep yards, that will only get used a handful of times a year. If you’re really lucky, you may have inherited a set of yards on your block that you may be able to repair and modify to suit your needs. After all the best set of yards is a free set of yards! The old adage, they don’t make them like they used to certainly rings true when it comes to yards. Modern yards are usually made out of steel, and you purchase a number of panel sections to construct your yards. Some yards are designed to be portable, meaning you can reconfigure your layout, or even relocate your yards. Older yards were usually made with locally milled timber and fencing wire. Posts were set into the ground and the layout is fixed. 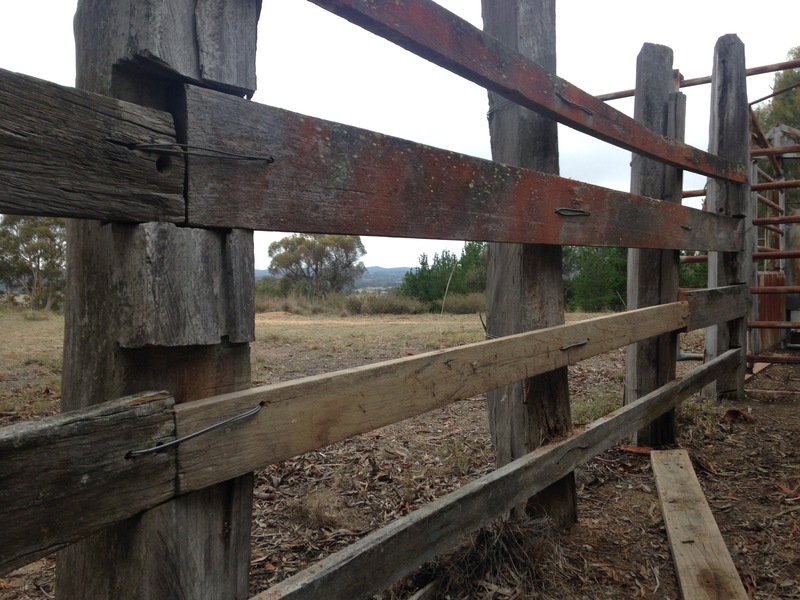 On our block was a tired set of timber cattle yards in need of some maintenance. I also wanted to modify them to allow me to work sheep. The first step was to replace a couple of rotten panels. Panels can be replaced with anything that provides a solid visual barrier to the stock. With an abundance of stringy-bark saplings, I decided to try using some timber from the block to repair a couple of lower panels. In the race, a more solid barrier was required. I found a piece of milled hardwood in my shed that was long enough to be cut to size. Timber yards are rarely held together with bolts or screws. 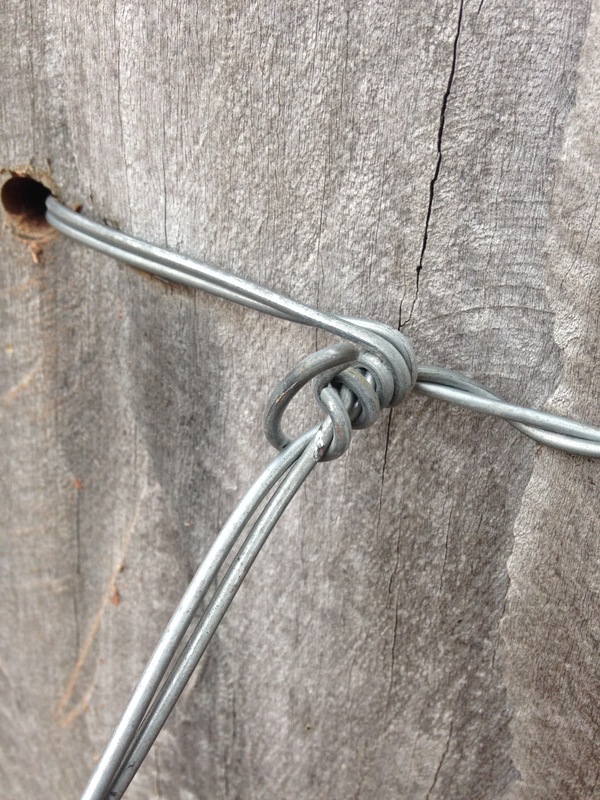 Instead fencing wire is used to tie the panels to the posts. A very simple knot is used that anyone can tie with a pair of pliers. The knot tensions the joint, providing a secure fixture. Once all the panels were repaired, the next step was to put some chicken wire over the panels to stop the sheep stepping through the panels. This was achieved by rolling out some short lengths of old chicken wire and nailing it to the panels. It sounds easier than it was. The timber was so hard, I needed to pre-drill the holes for the nails! 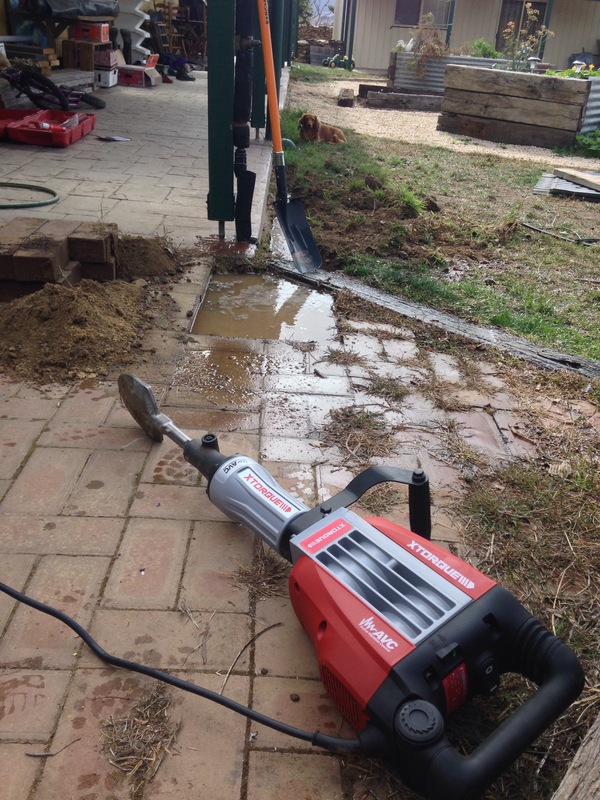 Finally it was all done – and our yards are now multi-purpose! Of course not all yards will be as easy to convert as ours were. In some cases, you might be better off starting from scratch. It all depends what condition your yards are in, and whether the layout will work for you. Good luck – and I hope you have as much fun repairing your yards as I did. What are the best sheep for hobby farming? Lamb is one of our favourite meals. Shedding meat sheep have risen in popularity in Australia over the past ten years or so and many breeds are now available. With plenty of choice available, it is hard to know which is the best sheep for hobby farming. In my mind, the best sheep for hobby farming must be hardy, quick growing and a proven performer on native pastures. They must also be easy to manage and low maintenance. We asked many producers in our local area what type of sheep they were running, and eventually settled on the Wiltipoll. The Wiltipoll is a breed developed in Australia. They are large easy care sheep, and may weigh up to 125kg in reasonable conditions. The ewes breed seasonally and are known as good mothers, with a high percentage of multiple births. They are also known to perform well on poor or rougher country that normally carries Merino wethers. They seemed to be the perfect sheep for hobby farmers like us. A short time later, we received a call from the breeder to let us know our sheep were ready. A little nervously I hitched up the ancient horse float for the trip. Thankfully all 16 sheep fitted into the float with no spare room at all – and they were soon eating a fire break in our fresh spring pastures. These sheep are hardy sheep, bred for meat production. They shed their wool naturally, meaning they are low maintenance and ideal for the hobby farmer like us. 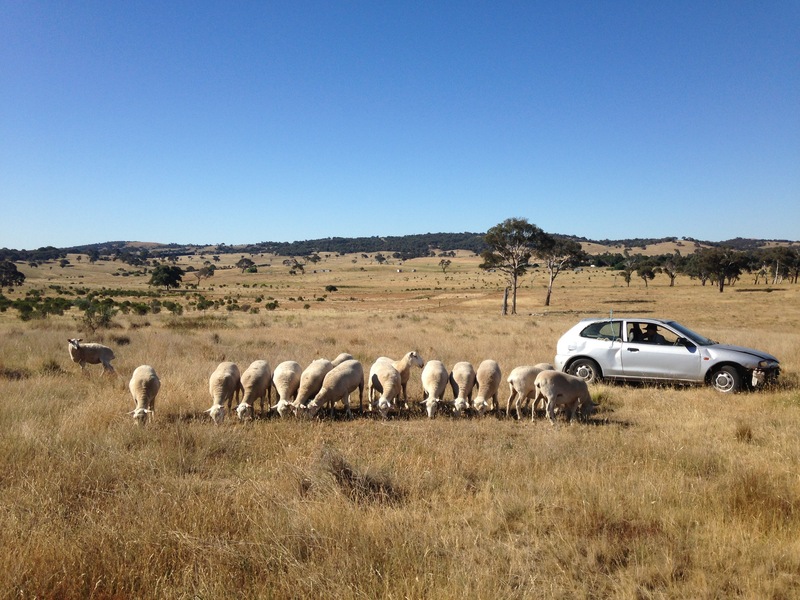 The first priority was to teach them to come to me – also known as bucket mustering. A 4 litre bucket of oats was given to them daily for the first couple of weeks, and it didn’t take the sheep long to come when I called. Even now, at least once a week I give them a small amount of oats, just to keep them coming to me. It was worth all the effort just once when I found them in the neighbour’s place. A quick call, and all our sheep were back on our side of the fence – allowing me to repair the kangaroo hole. We haven’t lambed yet – but when we do, I’ll be sure to post more about our wonderful Wiltipoll sheep here. Please let us know what your thoughts on the Wiltipoll sheep are, or if you have any questions by leaving us a comment below. Whilst a bubbling brook by the back door sounds wonderfully peaceful, there is nothing peaceful about finding a new water source with a jack hammer. This happened to me the other day, and caused me some angst. 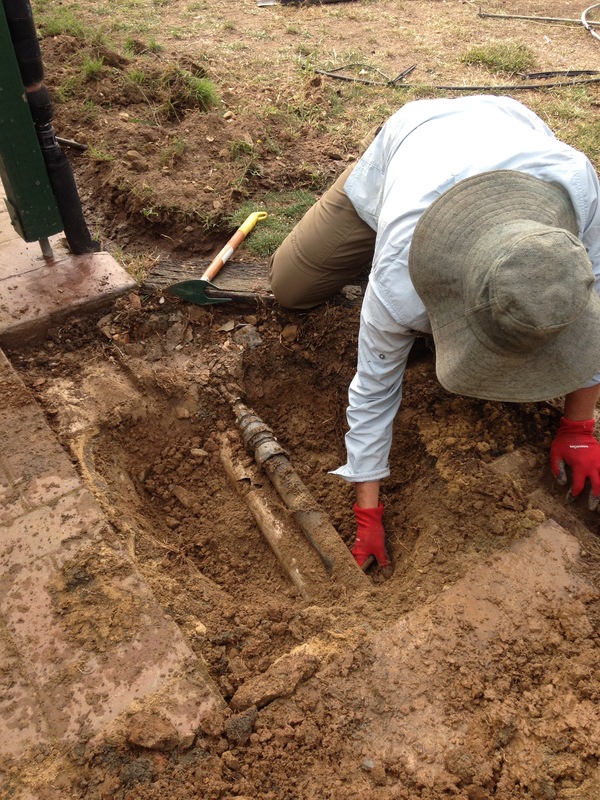 I was digging to put a new fitting on some 2 inch poly pipe. I had carefully followed the pipe and avoided the water inlet to the house. As I found the pipe I was looking for, I brought the jack hammer in to expose the pipe so I could clean it prior to fitting the new joiner, when all of a sudden, water shot up at me. Oops…. The mighty hound is not impressed. As is always the way when I have just broken something or done something spectacular, Jo arrived and surveyed my handiwork. So I did the only sensible thing I could think of. I enlisted her help to bucket out the water and survey the damage. As feared, I had penetrated a down pipe. The pipe was full of water destined for our water tank. It was imperative that I get the pipe repaired as soon as possible. At this point in time, I could have called a plumber to come and have a giggle at my expense – or I could have a go at repairing the joint myself. The problem with repairs to 90 mm pipe that is embedded in the ground, is that you can’t use two slip joints to repair the pipe. I had to use a flexible rubber joint – and of course I didn’t have one of those in the shed. After a quick dash to town for the relevant bits, it was a simple process to cut out the damaged pipe (it was cracked as well as holed). After a trial fit, the slip joint was glued into position. The flexible joint was then slid up over the gap and the hose clamps tightened. I used a smear of waterproof lubricant to make it easier to slide the flexible joint over the pipe. After refilling the system with water (including several flushes) the system was checked and found to be holding water. I was then able to put the new joint on the rural poly pipe above the down pipe and declare the little job completed. Well – there was the small matter of filling in the hole and relaying the bricks, but the hard bit was done!